Базовые растительные масла издавна используются для ухода за кожей. Масло, изготавливаемое из цветков календулы, является одним из наиболее популярных в косметологии. Масло календулы применяют для ухода за кожей любого типа, в том числе детской, но особенно оно полезно для сухой, проблемной и склонной к раздражению. Сухую кожу масло смягчает, а у жирной убирает неприятный блеск и сужает поры, в увядающей усиливаются процессы регенерации, снижается образование свободных радикалов, существующие морщинки уменьшаются и предупреждается образование новых. Масло календулы нередко выбирают для проведения массажа. The oil can be used to purify the skin, as well as to bleach it, to get rid of pigment spots, freckles. Restoring the water balance of the skin, it moisturizes and softens it. Oil helps to soothe the skin, increase its resistance to adverse environmental factors, such as wind, cold and intense sunlight. Calendula is a component of many sunscreen cosmetic products, as it is able to protect against the negative effects of ultraviolet radiation. Those who have a problem in the form of varicose veins, calendula oil helps reduce vascular networks. Due to antiseptic properties, calendula is able to counteract the viruses of herpes, influenza, fungal skin lesions, rashes of different origin. The oil on its basis helps to get rid of pimples and boils, to smooth scars from scars, to heal bruises and small wounds, cracks, insect bites, bruises, pressure sores and burns and even cope with eczema. For the healing of cracks, it is possible, for example, to apply gauze wipes moistened in oil to the problem area until complete healing. Регулярное применение масла календулы помогает избавиться от бородавок, мозолей, смягчить огрубевшую кожу на локтях и пятках. 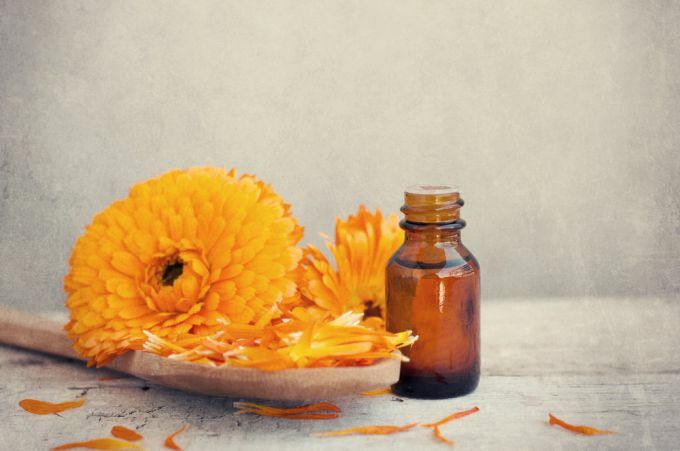 Calendula oil can be used as an independent skin care product, although some prefer to add it to face or hand cream, cleansing lotion or other cosmetic cosmetics. With masks of calendula, hair masks can be made, including mixing it with other caring vegetable oils. Calendula oil is made from flowers of the plant, which are also known as marigolds. It can both be bought in a pharmacy, and cooked and independently. To do this, the flowers of marigold should be filled with base vegetable oil (sunflower, olive or other) and insist for 20 or more days, periodically shaking. Based on the oil of marigold they also make ointment. For this, beeswax is added to it, put on a water bath and stir until the wax dissolves. Like oil, ointment is used for varicose veins in the form of compresses, with diaper rash and dermatitis, in the presence of wounds and scars, inflammation. Ointment contributes to the rapid recovery and healing of the skin. It can be used for facial skin care, purification and narrowing of pores, removal of inflammation from acne, narrowing of dilated capillaries, reduction of sebum secretion in oily skin. And men can use it as a balm after shaving. Contraindication for the use of oil and other products based on calendula is an individual intolerance. In this case, there may be an allergic reaction, itching.